and a rant about her BEING the one, and only, Rainbow Brite. Honestly, I was a bit turned off by it, as I didn't think the Rainbow Brite moniker should belong to only one person. 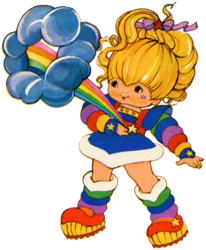 Rainbow Brite, the character, would be happy to have a multitude of people identify so strongly with her, I believed. And, it was a nickname friends had given me at the time. So it spurred a tiny competitive spark within me. From her page, I discovered the Rainbow Brite Webring, and followed it to the next page in the ring. That page belonged to Vincent Wales aka. Cardigan, who had created the webring. Vincent and I became fast friends and the following year, 1997, when I created my first webpage, I showed it to him. Now, I was VERY new to making webpages. There were no courses in my high school on how to build them, so I had to teach myself. With the help of my brother, Jeremy Cartee, our mutual friend, Brian Cape, and many Internet searches, I was able to put a very basic Rainbow Brite page on the web.